Outlined below is a basic review and history of the S30 model line. We also briefly touch on the newer 240z concept car. This information is designed simply for the beginer or as general reference. For more indepth information be sure to check out the Nissan S30 Wikipedia page or see our Resources page for links to other information Z-Car sites. The Nissan S30 which was sold in Japan as the Nissan Fairlady Z and in North America as the Datsun 240Z; is a classic race car coupe. The Nissan S30 was the first generation of the Z GT two-seat coupe and the 240Z was the first model produced in 1970, 1971, 1972 and 1973. Although Nissan was an active brand in international markets, their import cars were sold under the Datsun marquee in North America. Thus for this reason the car is known in the United States, Canada and Mexico as the Datsun 240Z. The Datsun 240Z was popular during its production as it was a low cost alternative to higher priced sports cars from overseas made by auto brands such as Jaguar, BMW and Porsche. 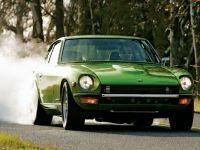 The 240Z continues to be a highly sought after car today among racing, rallying and drifting enthusiasts along with classic, vintage and Japanese car collectors. The original Nissan S30 was designed by Yoshihiko Matsuo and brought to the American market by Yutaka Katayama, president of Nissan Motors for USA operations. The 1970 and first half of model year 1971 were referred to as the Series I and were unique in that they had a few different exterior stylings than later model Nissan S30 cars. During the Datsun 240Z production run from the second half of 1971 “Series 240Z cars” and continuing through model years 1972 and 1973; Nissan continued to modify the cosmetics of the car including interior and exterior redesigns. It should be noted that 240Zs made during 1970 and the first half of model year 1971 are known as “Series I” and are unique from other years in that they have a chrome 240Z badge on the sail pillar and two horizontal vents in the rear hatch. These are below the glass molding and allow ventilated air flow. Also note that the 1971 model year was the first time the three speed automatic transmission was made available as an option. The 240Z has two distinct honors including being the winner of the 1973 21st East African Safari Rally. The driver was Shekhar Mehta. In 2004 Sports Car International also named the Datsun 240Z as the second best Top Sports Cars of the 1970s. Nissan launched a unique program in 1998 in order to stir up attention to the 240Z and bring the Nissan S30 line back into the public eye. In an unprecedented move, Nissan purchased original 240Zs and restored them back to factory specs. These were sold to dealerships for $24,000. A year later in 1999 a concept car was unveiled however future designs have deviated from the classic style.